If you are a fan of the game of baseball, you'll love the graphic novel FUZZY BASEBALL by author and illustrator John Steven Gurney published by PAPERCUTZ which specializes in the creation of comic book stories for young readers and teens. Enjoy America's pastime all year long within the pages of this wonderful story that promotes themes of perseverance and good sportsmanship through a tale of ninth inning heroics during a baseball game between two rival teams. These aren't just two ordinary teams though -- the Fernwood Valley Fuzzies and Rocky Ridge Red Claws are long time rivals ... and they're rosters are made up entirely of animals such Jackie Rabitson the bunny playing in centerfield for the Fuzzies to Gator Gibson the alligator who pitches for the Red Claws inspired by real athletes like the Dodger's Jackie Robinson and the Cardinal's Bob Gibson. A dominating pitcher for St. Louis, Gibson earned 17 strike outs versus the Detroit Tigers in Game 1 of the 1968 World Series. Jackie Robinson is know not just for being a gifted athlete who played second base for the Dodgers but also as the first African American to play in Major League Baseball. 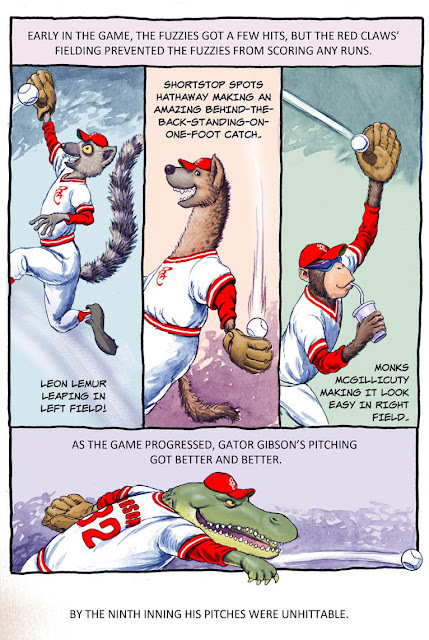 In addition to enjoying the well drawn illustrations of the characters in the book, readers can also delve deeper to learn more about the real people that inspired the play on names used in the book plus learn a bit about baseball strategy as they read through the story. The Rocky Ridge Red Claws are the dominant team composed of rough and tough players who will do whatever it takes to win a game. 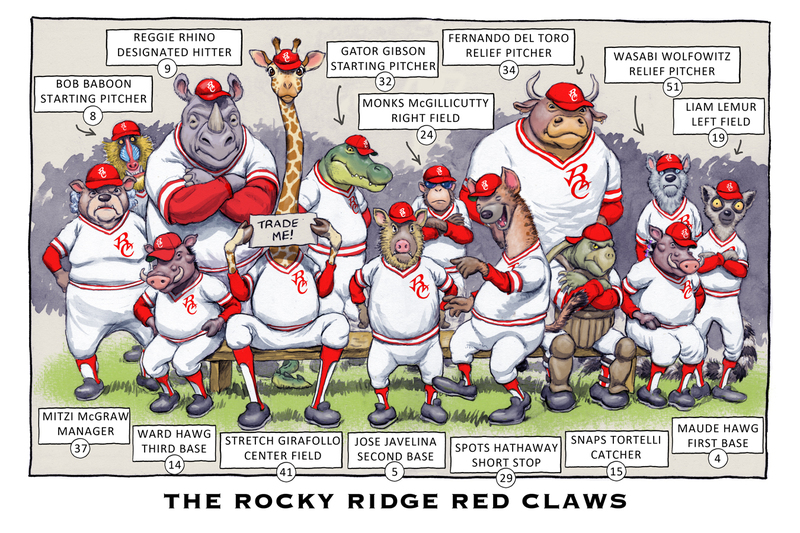 Though they have a hyena playing shortstop the way this team plays is no laughing matter. Let your guard down playing against this team and Snaps Tortelli will put a bite into you or you'll get gored by Reggie Rhino going yard against you. 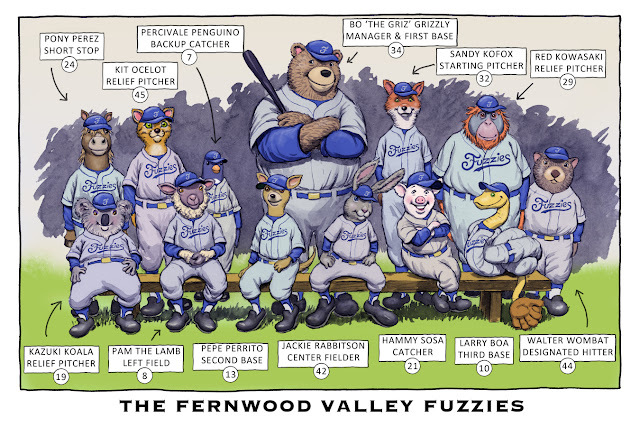 The Fernwood Valley Fuzzies are the underdogs in this match up of long-time rivals. The team is led by a grizzly veteran manager who also plays first base may be out-sized by their opponents but they don't give up. With players like Pony Perez, Pepe Peritto and Jackie Rabitson the Fuzzies have the agility and speed on the field and the base path to give any team a run for their money. Who wins the game? You'll have to read the graphic novel to find out! What I can say is that the pages are incredibly drawn so that flipping through the pages of this graphic novel to take in the illustrations is a very enjoyable experience as Gurney brings to life the players on these two teams as well as the audience taking in the game, as adorable animals that kids, and kids at heart, will be delighted by. Despite the wild characters in the book, it's story stays grounded with realistic sports premises and examples that make the fantastic elements relatable to actually feeling like you are taking in a baseball game. In addition to its excellent artistic attributes, the author also does a nice job scripting out the story so that in addition to enjoying the artwork the book is also a very entertaining read. 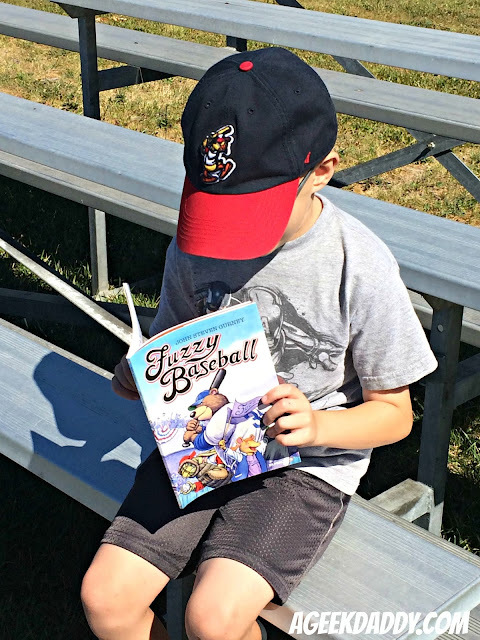 FUZZY BASEBALL is a book that my son and daughter both will regularly pick out from our book shelf to read over and over again. 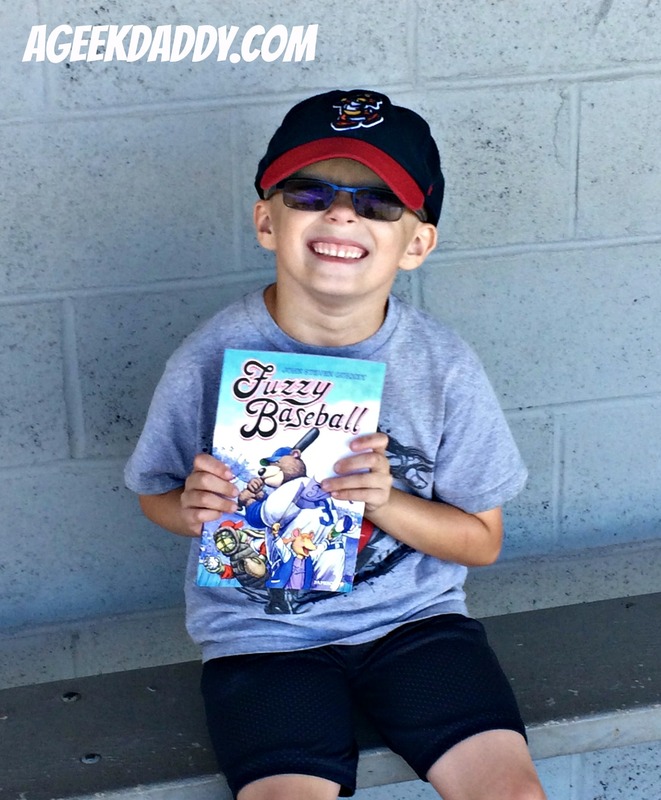 It's also a story that this passionate Detroit Tigers fan will even admit to enjoyed reading through on his own and thoroughly enjoying because hey who says parents can't embrace enjoying a children's book too! 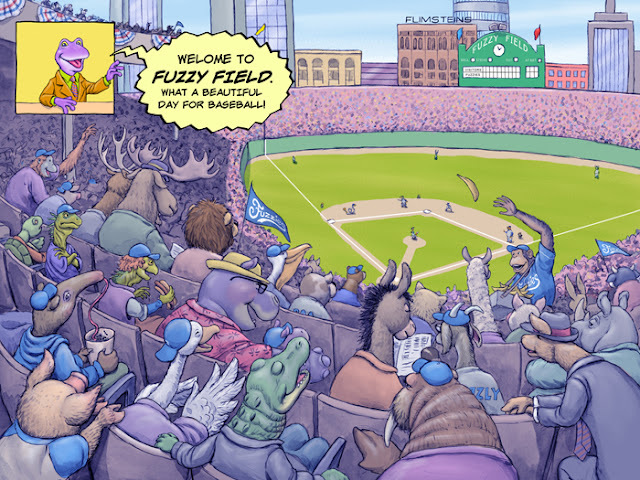 With well-developed and well-drawn characters and a fun baseball story that my children love this comic book aficionado and life long baseball fan gives FUZZY BASEBALL a nod of approval from A Geek Daddy.